At Home with Mrs John Profumo. Posted: March 25, 2013 | Author: thelondoncolumn | Filed under: Architectural, Class, Corridors of Power, Events, Housing, Interiors, London scandals | Tags: Chester Terrace, Christine Keeler, Evening Standard Homes and Property, House and Garden, John Profumo, London property market, Profumo Affair, Scandal, Stephen Ward, Toynbee Hall, Valerie Hobson |Comments Off on At Home with Mrs John Profumo. 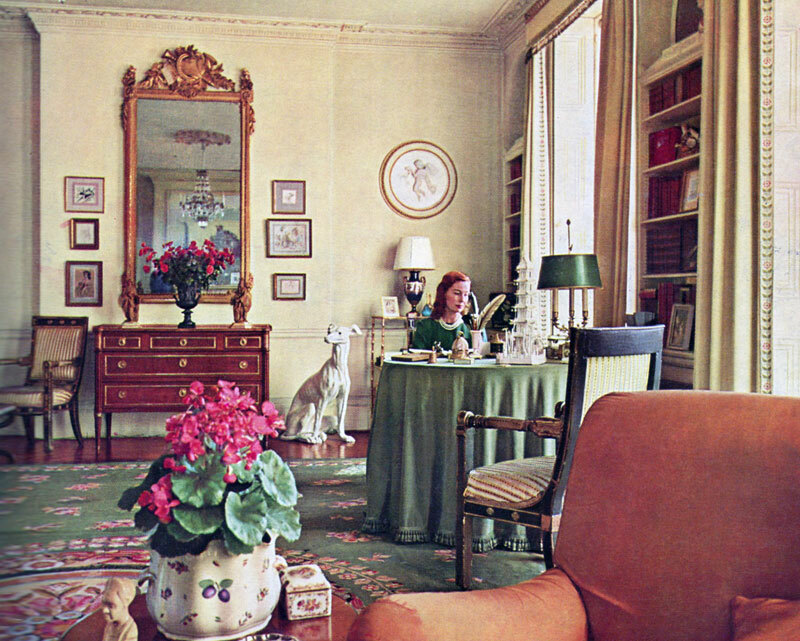 ‘Mrs Profumo in the drawing-room with her white French faience hound.’ Uncredited photo from House and Garden, Conde Nast Publications, 1962. Mr. and Mrs. Profumo (she is Valerie Hobson, the actress) live in a typical-looking Regent’s Park stuccoed villa, which has certain highly individual touches, the most covetable being a large garden and a magnificent drawing room. An improbably large area of the house is given over to the drawing room, which must be one of the largest rooms in London to be found in a house of comparatively modest size. With its double-cube proportions, three fine windows, opening on to the garden, and gaily disciplined Nash decorations, this is a perfect room for a couple who must, perforce, engage in a great deal of entertaining. A quick glance into Mr. Profumo’s own study provokes the wish that more masculine, magisterial ministerial rooms were half so attractive! 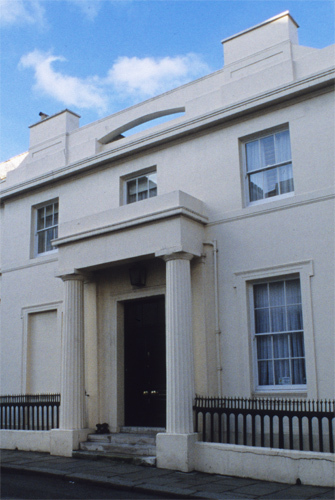 Needless to say, the desk is large and if you look carefully you will see a highly decorative as well as highly confidential red ministerial despatch box on it, doubtless often impelling the owner of this charming house away from the family circle to the chores inseparable from high office. Our meetings were very discreet. Jack [Profumo] drove a little red mini car. … If we were not in the flat, then we would just drive and drive for hours. Of course, it was impossible that our discretion would be absolutely complete. There was that amazing evening when Jack was round, and an army colonel showed up suddenly looking for Stephen [Ward]. The colonel couldn’t believe it. Jack nearly died. The funny thing is I never used to think of Jack as a Minister. I can not bow down to a man who has just got money or a position. And I liked Jack as a MAN. The passage of time has rendered the uncredited House and Garden text as poignant as it is comic. The gushing prose is at odds with the attitude of Valerie Hobson in the picture, lost amidst the chilly perfection of her vast drawing-room. Her husband, despite his vivid presence in the editorial copy, fails to appear in any of the pictures of the interior of their Regency villa, presumably due to the demands of the business of state – or, as implied by Christine Keeler’s racy memoir, some other kind of business. This issue of House and Garden appeared in 1962, not long before Profumo’s mendacious statement to Parliament, which left a host of hostages to fortune, eventually leading – as everyone knows – to his resignation as Secretary of State for War. Today, politicians have ample opportunities to reinvent themselves after a career-ending debacle: Neil Hamilton, Jonathan Aitken and even Jeffrey Archer have achieved a degree of rehabilitation and it seems likely that Chris Huhne and Vicky Pryce will eventually re-enter ‘public life’ in some form or other. As the pioneer of modern political scandal, John Profumo had no such option: instead, he chose a practically Roman form of self-abasement, cleaning the toilets at Toynbee Hall in Whitechapel (a task he continued to do until the management suggested that there might be better ways of using his skills). He did, eventually, gain a limited re-admittance into high society but even that took him decades. What of Mrs Profumo? As Valerie Hobson, she had been one of the most popular actresses in Britain, best remembered now for her role as the grown-up Estella in David Lean’s 1946 version of Great Expectations and as one of Dennis Price’s conquests in Kind Hearts and Coronets. Trophy wives don’t come any classier, and she was the perfect accessory for a PM-in-waiting. Pre-scandal press photos show a glamorous, high spirited couple; the tone of the House and Garden copy echoes those images, which have an air of genuine happiness about them. The photo of her ‘at home’ could not offer a greater contrast; if we didn’t know who she was, or what her circumstances were, we would still see this picture as a study in melancholy. It is tempting to speculate that she had already guessed the role she was ultimately destined to play. She had gone from being a screen star to an ambitious politician’s wife, and finally the embodiment of dignified suffering: a mute witness, as still and silent as her ‘white French faience hound’. Former home of Mr. and Mrs. John Profumo, Chester Terrace. Photo © David Secombe 2011. This Grade I-listed property at prestigious Chester Terrace overlooking Regent’s Park, was once the home of shamed politician John Profumo, who lived in the splendid stucco townhouse during his much-publicised affair with model Christine Keeler in the Sixties. The scandal forced his resignation as secretary of state for war and damaged the reputation of Harold Macmillan’s government. Designed by John Nash, the architect responsible for much of Regency London, the elegant, four-bedroom house now has a cinema room, wine cellar and enchanting garden. If only walls could talk… Call [estate agent] if you have £10.95 million.